Imagine it’s a quiet afternoon and you’ve got the house to yourself. You slump down into the sofa. You’re going to put on some tunes – something mellow – and relax. Maybe you’ll finally open that new book you’ve been meaning to read. But as soon as you tap the play button and open your book – whoosh! The air conditioner roars to life. Now you can barely hear your music. You’ll have to turn up the volume. And while you’d like to concentrate on your book, you can’t. You’re worried that you might not hear the doorbell if it rings. Or your phone if it vibrates on the counter. Everything was fine until the air conditioner came on. Now those noisy air ducts are intruding on your solitude. Except it might not be your ducts. It might be something else. Ducts don’t make much noise on their own. The air moving through them makes noise, and a variety of factors can make air movement more (or less) audible. Closed vent dampers: One closed damper probably won’t make much difference, but closing several dampers at once might make your system noisier. Closing supply vents actually puts undue stress on your HVAC equipment. It’s a good idea to keep them all open, noise or no noise. Sagging or bent flex ducts: If flexible ductwork isn’t installed properly, it might sag or bend. Those sags and bends can make it harder for your system to move air, which can increase static pressure and create noise. Dirty air filters or ducts: Over time, the dust and dirt buildup on your air filters and inside of your ducts makes it hard for your equipment to move air. It can also make the system noisier. The solution is to clean or replace your filter regularly and have your ducts cleaned if they start to impede airflow. If you’ve checked on all of these things and addressed the problems, your ducts might not seem so noisy. But if they do – and you’re keen on making your system quieter – there are some additional steps you can take. We’ve written about static pressure before. Every system has some, but many systems have too much. When static pressure is too high, it means your ducts can’t adequately accommodate the volume of air that your equipment is trying to move through them. And when the volume of air exceeds what your ducts are intended to handle, you get noise. Adjust the fan speed. Your blower or furnace fan should be set to deliver the proper airflow per ton. In theory, your HVAC installer configured it properly during installation. In reality, not all installations are perfect and many fans are set at too high a speed. It’s often possible to select a lower fan speed, which will reduce static pressure as well as air noise. This fix only works when the fan speed was too high in the first place. Reducing the speed when the system was properly set up could result in a lack of airflow throughout your home. Add ductwork. Sometimes, equipment is sized properly, but ducts are too small to accommodate the volume of air. When this is the case – and it’s a common problem! – increasing ductwork can decrease static pressure and make your system quieter. We usually install larger ducts in the accessible area around your blower or furnace and can often expand the size of your return and supply plenums. Add a bypass duct. If you have multiple zones within a single system, it’s sometimes possible to add a bypass duct that relieves pressure within the system and reduces noise. Add or expand grilles and registers. In our experience, most homes don’t have enough return air. Adding new returns or increasing the size of an existing grille is one way to decrease static pressure and help your system move air. It can cut down on noise, too. When possible (and when it makes sense), we can also tie new supply registers into your ductwork or increase the size of existing supply registers. Replace existing registers and grilles with high velocity models. Sometimes, the type of registers and grilles you have are to blame for the loud air noise. Switching them out for “high velocity” alternatives can allow more airflow and lower static pressure. If it’s time to replace your HVAC system, you’re in luck! Assuming you select a new system with a variable speed blower, it’s almost certain to be quieter than the standard blower you’re replacing. That’s because variable speed blower or furnace fans usually run at a low speed, circulating air throughout your home more consistently than the old school, on/off systems you’re probably used to. The fan speed varies depending on the cooling or heating load, but the fan operates at lower speeds most of the time. And since less air is moving through your ducts, noise levels are lower – sometimes dramatically so. You’ll still know your system is working. After all, it’s pretty obvious whether you’re comfortable or not! But you might not hear it running unless you stand under a supply register and listen. In some systems, variable speed blowers really are that quiet! All else being equal, hard pipe ducts are noisier than flexible ducts. Air moving over metal is just… louder. Compared with flexible ductwork that contains no obstructions, kinks, or bends, you’ll probably hear more noise with hard pipe ducts. Hard pipe ductwork is less prone to kinks and bends, so it’s usually better for airflow. Flexible ductwork is prone to kinks and bends, so it presents more points of failure for airflow. Basically, flex ducts = less noise and possible airflow issues while hard pipe ducts = more noise and fewer airflow issues. It’s a tradeoff. That’s not to say hard pipe ducts are always loud. Assuming they’re properly sized for your home and your system, you’ll probably hear minimal noise from all-hard pipe ducts. If you’ve got a variable speed blower, that’s definitely the case. Just be aware that hard pipe ducts tend to be noisier than their flexible counterparts. Not always, but usually. Here’s another situation where system infrastructure makes it hard to cut down on noise: Homes with a single, central return. You see these in smaller homes, like condos. In these homes, builders sometimes install a furnace or air handler right on the return plenum, which is ducted to the central return or, occasionally, a hole in the wall with a grille on the other side. Even with variable speed equipment, it can be hard to quiet these systems since the blower motor is right there and there’s minimal space for additional ductwork. The problem has to do with space and design. If there’s enough space to add ductwork or rearrange the system components, that can help with noise. Other space/design issues include an air handler installed just behind a bedroom wall or a furnace that wasn’t installed on rubber pads. Sometimes, it’s possible to fix these problems. But not always. We just took up a lot of space discussing static pressure, HVAC equipment sizes, and ductwork installation quality – all in an article about airflow noise! That’s because the noise itself isn’t usually the problem. You need to fix the thing causing the noise. After checking for closed vents and fixing kinked or sagging flex duct, your best move is to have an HVAC professional measure the static pressure in your system. 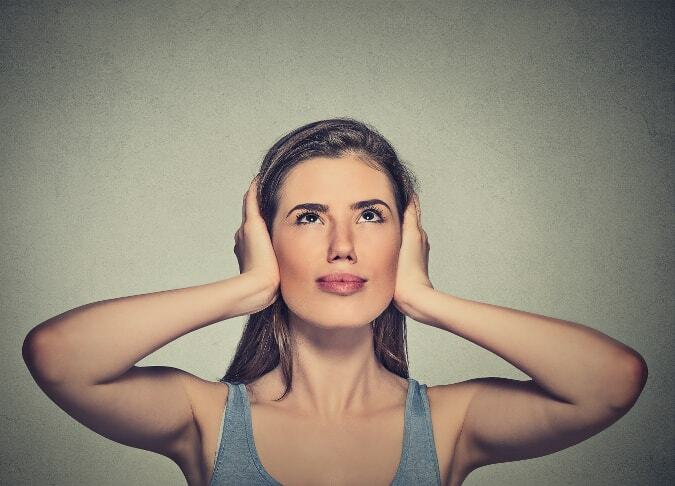 If you’re hearing a lot of noise, static pressure is probably high. After checking things out, the contractor will likely propose one or more of the solutions we just discussed. Fix the bigger problem, and the noise usually goes away. Then you can finally enjoy those tunes, dive into that book, and take a load off. You can also forget about those pesky HVAC and air duct problems. You won’t have them anymore.